I have a 2010 Pro. I upgraded my hard drive and it's not being recognized by the computer, what do I do? More information on specifically what you have tried would be useful. I don't know by what method you are trying to recognize the drive. I don't know if you are migrating data from a previous drive, if your previous drive has died, etc. If you've simply put a new hard drive in the computer, I would recommend doing an Internet recovery (see attached picture) by powering on while holding down option-command-R. This will allow you to log into your WIFI, and then the computer will connect to Apple and download a recovery partition to your drive. 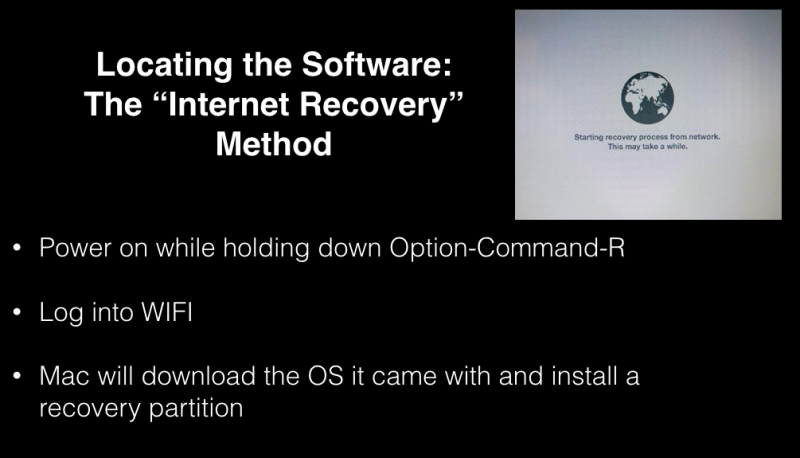 Once you have a recovery partition, you can install the OS to the drive from the recovery partition. The version of the OS it installs will be the one that came with the computer (i.e. an old version), so once it's installed you'll need to do a software update to get the latest version. At that point you can do a data migration of your previous files and apps, etc. Again, I don't know what specifically you've tried, but a common problem with a new hard drive is that it's in the wrong format and therefore not appearing or unable to take an OS install. You want to use GUID (as opposed to FAT, NTFS, etc. ), and format it as Mac OS Extended (Journaled). Anyway, let me know if that helps, and if you provide specific details on what you've tried, I'd be happy to assist further.